Is your tech use “sparking joy”? Spring is here, but perhaps you already got a jump on your spring-cleaning ritual in January, as Marie Kondo fever took over our collective screens and homes. (Marie Kondo is an international tidying expert with her own show on Netflix who helps clients de-clutter their homes and find joy.) If so, why not use this time to consider some tech-use makeovers you can share with your clients and their families—with a focus on what actually sparks joy. ASHA provides some “Digital Diet” tips from its Healthy Communication & Popular Technology Initiative. Print them out for clients or students, discuss the strategies with caregivers and families, and challenge your own family (extended family, too!) to start the season with a refreshing approach to household tech time. Carve out dedicated tech-free times each day. Pick a time, even just an hour or half-hour, when everyone in the family puts their devices away. No interruptions allowed. Try dinner time or the hour before bed. Then use the time to recharge your family connection. Dedicate tech-free zones in the home. Feeling more ambitious? Take one of your newly decluttered, serene spaces inspired by Kondo—such as the family room or kitchen—and further transform it into a tech-free zone. Designate this space as an oasis away from the noise and distraction of social media, email, video games, texting and everything else that keeps us on edge, distracted and disengaged. Do a tech audit. It’s easier than ever to see how you and everyone in your family is spending their time online. Many smartphone, tablet and computer operating systems now automatically log time spent on various apps and send weekly screen-time reports. Make time to really take a look—and digest—how many hours a day you spend on various apps. Is this time well spent? Is what you do online “sparking joy”? These reports might inspire you to make some changes. Make a tech swap. 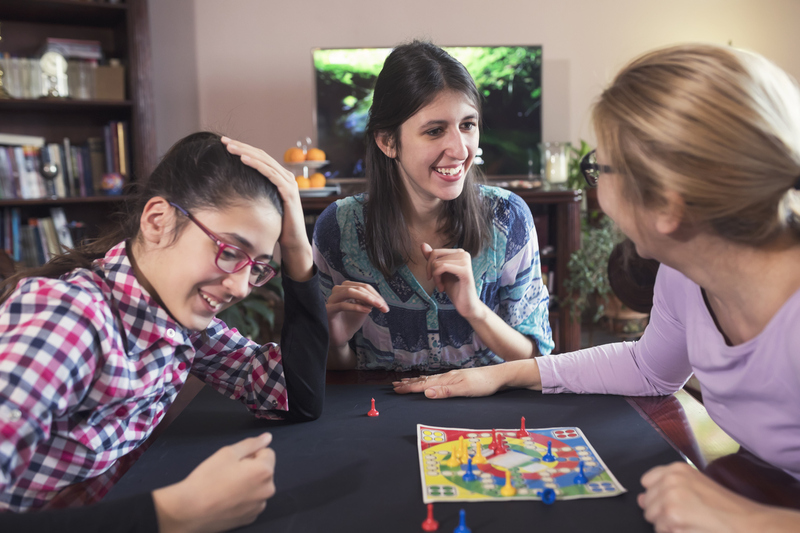 Swap out a modest amount of tech time for one other activity a day or week … playing a board game, taking a family walk around the neighborhood, or anything else you or your family might skip in lieu of screens. We often feel so busy, but everyone could surely find 30 minutes typically spent on their phones or tablets to make room for this quality face-to-face time. Create a family technology plan—together. Sometimes, a formal commitment drives adherence. Want to make healthier tech use a habit rather than a passing fluke? Create an agreed-upon set of rules around family members’ technology use—when, where, how much, for what, with whom—to keep everyone on track. By involving your kids in the process, you will more likely achieve the results you want. Make screen time a shared activity. We tend to spend our time in front of a screen as a solitary activity, but it doesn’t have to be. If your kids like to play games on their tablets, ask if they can teach you to play … or even if you can just watch. Ask questions—let them teach you something. You’ll get a window into their world, giving new opportunities for communication and connection. Listen safely. With kids and adults alike logging more time than ever using headphones or earbuds as they listen to music, binge-watch a new show, or play interactive video games on their devices—in their homes and on the go—it’s critical to pay attention to the volume. No one wants to inadvertently set themselves or their children up for future hearing loss. The World Health Organization says 1.1 billion adults ages 18-35 may be at risk for noise-induced hearing loss from loud mobile devices. Turn the volume to half and take listening breaks. Want more information on healthy technology use? Check out ASHA’s Healthy Communication & Popular Technology Initiative and our Medium site. Please share your tips for balancing screen time with yourself and clients below! Happy spring! Editor’s note: Of course, children who use low- and high-tech augmentative and alternative communication devices (AAC) should continue to use them at all times—and in an interactive way.